Hey everyone! We want to apologize for our lack of updates on the site. There are lots of exciting things going on in our world (which you will be hearing about in coming updates!) and we have had to limit our time on the site while we work on them. 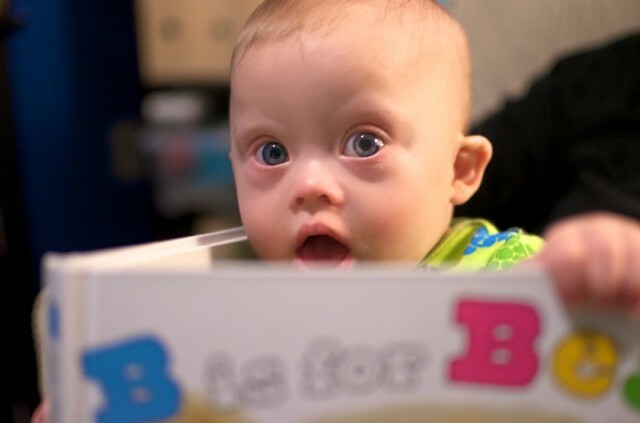 Rest assured we have continued to daily capture videos and images and will be posting them (hopefully in rapid succession) soon so that we stay true to our vision to create and post a daily one minute video about what life is like raising a son born with Down syndrome! By the way, we hope you enjoy the fun new intro for our videos! 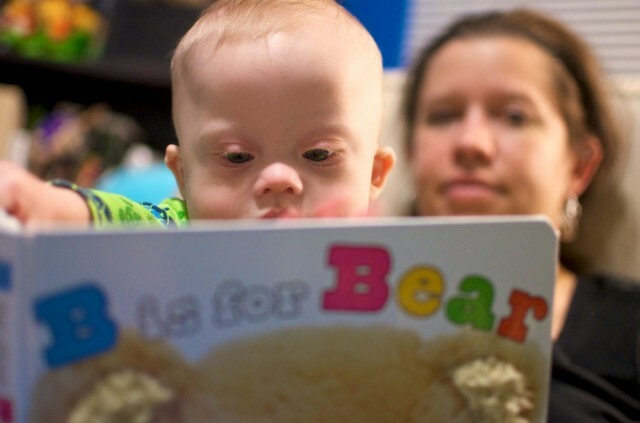 Noah and I always enjoy a good book before bedtime. 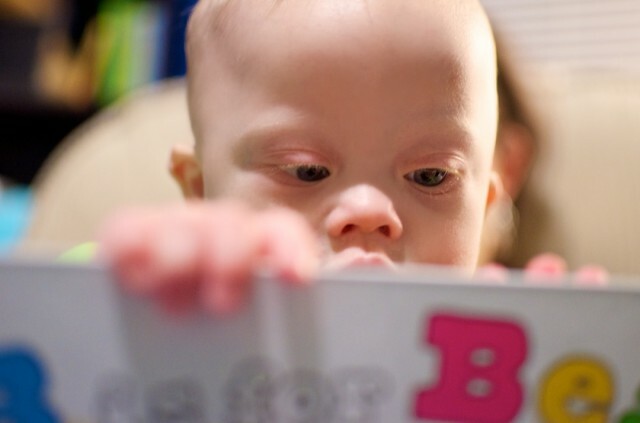 Noah however, thinks it is fun to get his hands all over the pages and what better way to help out his sensory development then with touch and feel books. I am a huge fan of Priddy Books, who published “B is for Bear.” I like this book because there are 26 pages of fun rather then just a few. Each page has its own large picture, and the majority have textures. Noah seemed to like W is for wet the best. He especially like touching the fascinating textures “bubbles” made of glitter all over the page. We are finding all sorts of ways to help Noah with his sensory development, but more on that later. You will have to wait in suspense for our future posts. 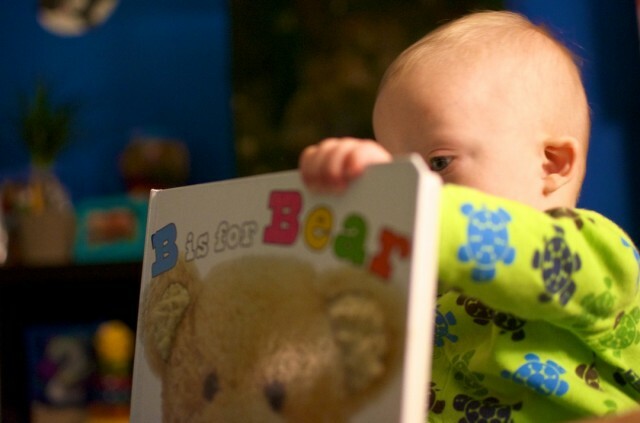 I LOVE “B is for Bear”. We also like those Peek-A-Boo Baby books ( i.e. peekaboo baby, playtime peekaboo, bedtime peekaboo, farm peekaboo, etc) because they are very tactile. Ellie will not sit through any *regular* book. BTW, really missed you guys and seeing Noah’s gorgeous baby blues. Love the new video intro! Lena and Claire both love texture books!!! Whoever thought of them should get a big ole pat on the back!! Shoot I love texture books too. I put my hands all over them 🙂 do they have any favorites?